This L-shaped runner was commissioned by a couple in San Francisco. 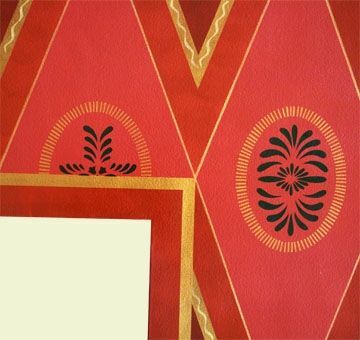 The design borrows from Ruby Slipper in our Geometric Collection, but the colors have been modified to match art work in an adjoining room, and a new design element — the squiggle surrounding the diamonds — has been added, which also picks up on an wall hanging seen from the hall. The background color is Tucson Red and the border and motif colors are Rich Gold, Pale Gold, Custom Gold, Red Earth and Custom Red. 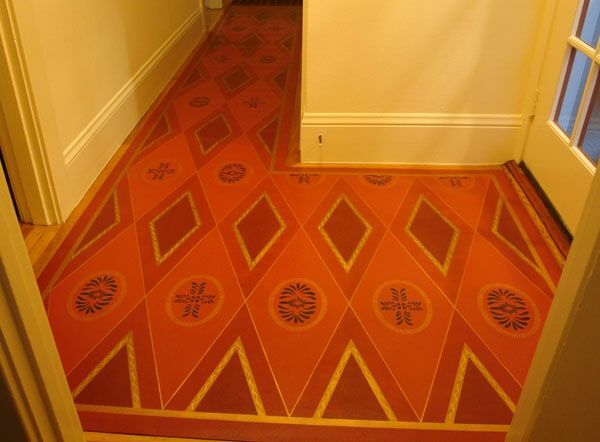 Dimensions: The floorcloth was sized to perfectly fit in the entry way and hall and measures 15' 6 3/4" long by 2' 6" wide in the long direction, and 4' 5" x 3' 1" in the entryway.